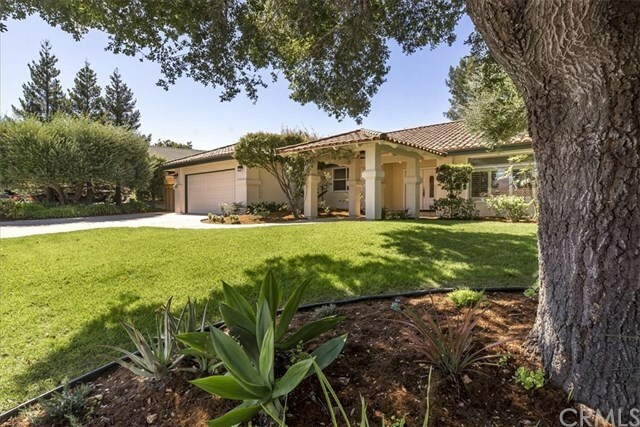 Step into this beautiful single-level home in the gated community of San Luis Country Club Estates. The property features 3 bedrooms with an optional 4th bedroom or office and 3 bathrooms with just over 3,000 square feet. The open floor plan with an abundance of natural light showcases the Kitchen which amenities include butlerâs/walk-in pantry with shelf organizers, all stainless steel appliances, center island with breakfast bar and storage. The informal dining area leads you into the large family room with access to the backyard - great for entertaining! The private dining room can be accessed just off the open family room & offers built in storage. The living room & family room have gas log fireplaces with views of the front & back yard areas. The 2nd & 3rd bedrooms are equipped with built-in organizers in the closets & share a full bathroom with double sinks plus have access to the backyard. The master bedroom located at the rear of the property takes in backyard views with access to its own private patio. The ensuite bathroom has double sinks, separate tub and shower, makeup vanity and walk-in closet with organizers. The private landscaped backyard allows for entertaining on an intimate or large scale. The 2-car garage has additional room for storage or work space & includes its own golf cart space with automatic garage door all with direct access to both the house and backyard. Rare opportunity to find a single level home in SLOCC Estates in this condition! Directions: Hwy 227/Broad to Los Ranchos, Right on Greystone through the gate then Left at Tamarisk.